Autumn is on it’s way as nature starts to turn inwards – a perfect time to take a up a new activity and learn to paint or improve on existing skills. Having returned from holiday, I am bursting with new ideas and activities in mind which will be put into action over the coming months. 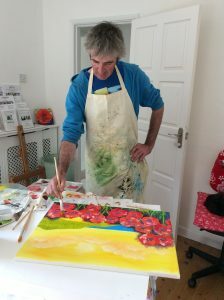 In the meantime, we a have a day’s workshop coming up in Newport, Isle of Wight, on Saturday, 24th September together with regular painting classes on Thursday afternoons commencing 27th October for six consecutive weeks. For all those art students who have attended classes throughout the year, we have an exhibition planned for Saturday, 1st October at the Salvation Army Hall, again in Newport, to raise funds for our local Hospice. Everyone is welcome – come and see what it’s all about. The exhibition will be opened at 10am by a Hospice representative. Not only will artwork be exhibited, but there will be craft stalls with tea/coffee and cakes available for purchase. We’d love to meet you.